The Hungaroring is notoriously one of those tracks with few opportunities to overtake and so it was encouraging that today's practice sessions produced an unusual mix of teams at the front, giving hope of a great qualifying session at least. McLaren was outstanding in this, fastest in both morning and afternoon, Williams quick too and the Red Bulls having to slot in a little further from the front than expected. That Brawn was even lower down the order was not too much of a surprise, since they tend to concentrate on getting everything right before going for very quick times. If the McLarens are really as fast as they promised, however, we can expect a tight battle in qualifying tomorrow. BMW have improved but not yet escaped the midfield, Heidfeld's ninth fastest spot in the afternoon the best that they could manage. There is hope on the horizon, according to Dr Theissen, but it has been a long and hard struggle for the team this season. The Toyota pair seem to be slipping back into mediocrity after showing so well in the early races and the trend continued in Hungary, neither driver able to stay with the quickest cars. How the team must be ruing the Bahrain race where they threw away their best chance of winning. And Ferrari, too, did not look good this time. It will be a great effort from the drivers if they are to make it into Q3 tomorrow. Otherwise, it is business as usual, Renault pretty anonymous in the lower order with the Force Indias and Toro Rossos. No doubt Alonso will produce something from the hat in qualifying but he must be getting very tired of the constant battle against the odds. The teams are taking a three-week break after this race and it is certainly well-deserved in Fernando's case. Man of the moment, Jaime Alguersuari (predictable proving a pronunciation challenge for Speed TV's David Hobbs), stayed on the road and put in times close enough to Buemi's to be respectable. In fact, he showed that most drivers from GP2 are capable enough to enter F1 without complete embarrassment, putting the current fuss over his age into perspective somewhat. With McLaren apparently over their aerodynamic problems, qualifying tomorrow should be a nail-biting affair and promises to be a three-way fight for pole between them and the usual Red Bull/Brawn contenders. I think the Brawns are sandbagging to some extent, however, and would suggest Button for pole this time. Hamilton has to be a good outside bet, however. I have to say i was very impressed by Alguesuari's feedback on the one conversation we were allowed to eavesdrop. He sounded very comfortable and discussed the handling in a number of conditions and was clear about what he thought was happening. He didn't sound like he was in anyway out of his depth. Ah, David Hobbs. Who can forget Elaine Prost? We can only hope David chooses not to try a Spanish accented mimicry. Still not up to snuff? Maybe a 3 week hiatus will fan your spark a bit, too. I may play hooky tomorrow morning to watch. The quali at Hungary usually is a bit more entertaining than the race. I think that the real challenge to Jaime will be the race as Michael points out above. 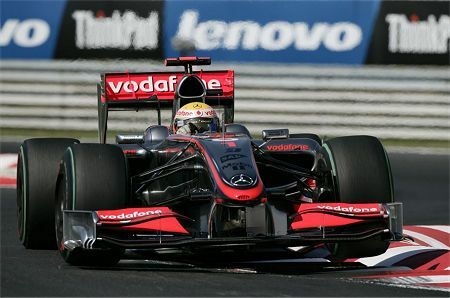 I´m not sure, but I think hat was him who was very slow in front of Jenson in the last corner — that is a blind one. Hope you ( Massa ) still ok,..